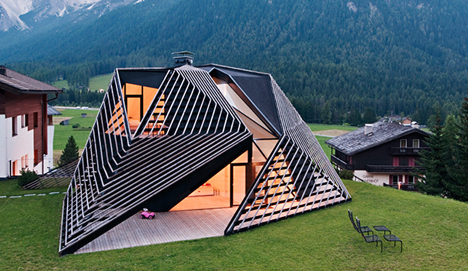 Residence Alma, a 1960s pitched-roof house in the Dolomites (a mountain range in Italy) is a beautiful and unique combo of traditional and modern, thanks to design and architectural firm Plasma Studio. The front of the house is traditional, but the back and sides (pictured above) have been modernized with an angular, slatted timber skin that adds air circulation and makes a great conversation starter. Read the full story (with tons of great pictures!) here.